Will Keller had an inspired business idea: Monastery Greetings, a mail order business for goods made at monasteries, convents, abbeys and hermitages around the world. He started the company in his home, but quickly ran out of room and moved into an old torpedo factory in Glenville on Cleveland’s east side. He now uses several different storage spaces in the industrial building to stock everything from Trappist-brewed ale to nun-baked dog treats. “About half my business is food,” he admitted while pointing out some of his more unique products, including grilling boards made by a hermit who lives on the grounds of monastery in Washington. Take our photo tour here and check out the complete selection of gifts at MonasteryGreetings.com. I was in living in Boston, hanging out at Harvard Square. I needed a job so I walked into a bookstore and got a job. This was the mid-’80s. I didn’t know anything about it. I didn’t have a plan. It was a religious bookstore that served two divinity schools in the area. They were part of a chain run by a non-profit organization. It was one of these old Bible societies that had expanded their mission to running these bookstores. I was interested in the idea that these businesses were integrated with non-profits. I worked my way up and got interested in direct marketing and technology. I computerized and networked all the stores. Back in the ’80s, the stores weren’t computerized. I had a choice. I could have gone to divinity school and taught religion or something. But that wasn’t for me. That’s not where my values and my spirituality fit in. I heard about this program at Case Western Reserve University that offered a business degree with a non-profit component. It was the Mandel School. At that time in the late ‘80s, that was the only program in the country. Yale was doing something but on an academic level and San Francisco was doing something but it hadn’t developed yet. I’m really interested in the idea that these are businesses held in common and these people can make a collective work, partly because they’re bound by a religious rule of life. They live on a level of generosity and are down to earth people. I enjoy working with them. When I started the business, I went a lot broader, including all religious denominations. I was selling potpourri made by the Shakers up in Maine and doing some business with the Amish. I learned in the world of marketing religious retail that ecumenical and interfaith doesn’t sell. You have to have a niche and people need to connect with some tradition. I then focused on Catholic things. I’m really interested in the idea that these are businesses held in common and these people can make a collective work, partly because they’re bound by a religious rule of life. How do you sell religious orders on the concept? It’s very hard. It took about two years. I was on the outside. And a lot of people had tried it before. But even though the monasteries aren’t necessarily looking to make big profits they all make something, so distributing it is just one more step, right? To some degree. It depends on the monastery’s way of life. Benedictines and Trappists are required to make things as their way of life. Other communities are completely cloistered and they live by charity. That’s a different deal. The communities I deal with, they connect to the world with these products and that’s how they live. As the business has evolved, we’ve even started helping communities develop products. At one point, these sisters in Texas had a praline recipe. They sent me some and they were amazing. They were all butter. I helped them not only with the packaging but with the price point. I figured out their wholesale cost because I wanted to make sure they made money. They weren’t good at that. In the busy season, I move 5,000 jars of jellies a week. That’s a blip to the community that makes it. 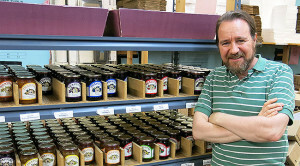 They make two batches of jelly and each batch is ten pallets of 250 jars. They just crank it out. They’re in all the big supermarkets on the East Coast. So, since they’re focused on that, I just took the retail piece off their hands. The community said, “Why have some secular business sell [our jellies] alongside barbeque sauce or whatever else is their catalogue? Why not use a company that sells monastery products?” Once I got it up and running, it made sense to people. How long have you been in this location–a former torpedo factory in Cleveland? About ten years. We did everything in a small office space to start, but ended up taking over more space. I have about half dozen employees year-round, but that increases over the holidays. How many products do you have and how many religious orders? About 1,600 different products from about 75 locations. Some of the products aren’t from religious orders, but they are religious in nature. What’s your best seller in bath and body works? The Pope’s Cologne. This guy in California found a recipe for Pope Pius IX’s cologne. It’s very citrusy. It’s different. I also have face cream made by these nuns off the coast of Norway. It’s harder to do things from overseas. The dollar is weak and the shipping is expensive. Oh, and these monks in West Virginia make soaps from goat’s milk. This guy in California found a recipe for Pope Pius IX’s cologne. It’s very citrusy. I’ve been selling beer for about three years now. The beers I sell are all made in monasteries or have a monastery connection.There are two states I can’t ship to—Massachusetts and Utah. Do you package gift baskets? I got out of that side of things. We have 1,600 products so people can mix them up how they want. Coffee and tea are a big deal and we have honey from a monastery in West Virginia. 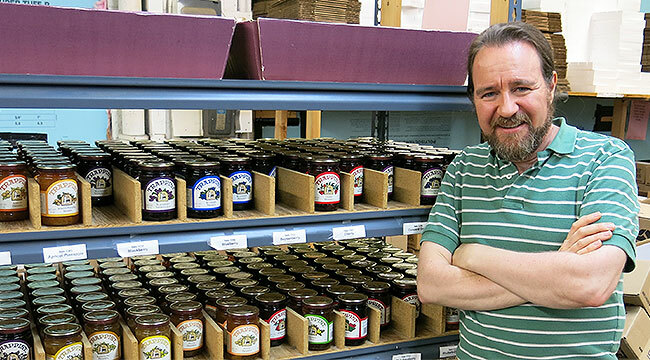 A guy in Maine has a restaurant in Maine and uses Trappist preserves in his hot sauces. Fruitcake is a seasonal thing. I see a little bit during the year and a ton of it at Christmas. Now half of them find me. I found these sisters in Indiana who make all these different cookies and they put them in this assortment that looks amazing. They make these old-fashioned German cookies, too. That’s an example of a group who really got it. Do you ever get something that doesn’t take good? Oh yeah. It happens occasionally. But more often I get things that are just too fragile to ship. From Devoutly Dill mustard to Monk-Shot coffee pods, check out a slideshow of a few Monastery Greetings product pics. For a more complete photo tour of the warehouse, click here. Fascinating read + great pics! We are proud of you, Will. Eben and Nancy Franks on Old Cape Cod…. Very satisfied repeat customer! We tried the tarts as an afterthought thinking they’d probably ship poorly and be stale and they were DELICIOUS! Just as if they’d popped out of a local bakery that morning. Great soaps and lotions, don’t get me started on the cookies and candies, oh my. Prompt delivery and good packaging, too. Alas, we’re in MA so we can’t get the beer, but maybe someday!